30 pin Apple connector to the Smaller 8 pin Lightning Convertor. 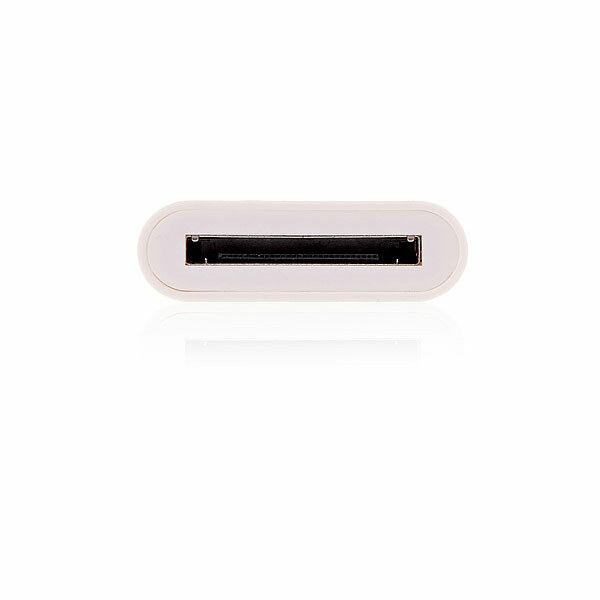 This product Converts Old Style 1 inch wide chargers, Data leads and Accessories to the new style iPhone Lightning 1 cm wide Connector. Don't throw away those older iPhone wider cables and accessories etc, this adapter allows you to use all those old 30 pin 1 inch wide products with your new smaller 8 pin 1cm Lightning product. Just clip on this convertor and away you go. This item may support analogue audio output USB audio*,as well as supporting syncing and charging. * We do not guarantee audio output with this product and only guarantee Audio output with our iPhone 5 & 6 Audio adapters. I have an old Sony stereo with a docking station that only takes an iPhone 3GS but that phone does not work and I want to use an iPhone 6 - I use it to play the radio through any ideas? Hi i have a iphone 6s & wish to connect to a old style Gear4 music dock with a 30 pin plug, i bought a 8 pin adapter which only charged the phone but would not play music. will your adapter do both ? Hi which model phone do you have ? Hi we would not recommend this item for audio we suggest this one :- http://www.world-of-accessories.co.uk/iphone-audio-adapter-converter-p-1663.html it will work with all speaker systems and some cars (we do not guarantee it will work with your car though). I have a B & W Zeppelin speaker with the 30 pin connector, which adapter would you recommend for iphone 6? does this work with audio and charging with the sony RDP-X30iP personal audio docking system? Made originally for iphone 4 but now want to use with iPhone 5s? Hi yes it will convert the old style docks to work with the iPhone 5. Hi yes it can be. Will this fit in an ipod docking station? Would I be able to use this adapter in conjunction with an Apple 30 pin to HDMI adapter that I already have? I'm looking for a less expensive option of connecting a new Ipad Air 2 to my TV. Sorry no its not for watching TV using with a HDMI lead. I am interested to buy this product, I would like to know , is it Genuine Apple product? Hi no it is our own version. Which is the best connector for a Gear 4 - House party 5 docking station? There look to be 2 types of connector for iphone 5s on the website. I have a B & W Zeppelin speaker with 30 pin plug. Which adaptor do you recommend to allow my iPhone 5c to connect with this? Will I be able to plug an AV/HDMI adapter into this to view my ipad content on my tv? Would this product work with the Acoustic solutions docking station? Will this work in the car. Have a bluetooth connector for iPhone 4 but need adaptor to work on my iPhone 5. Hi, I was wondering if this Convertor would allow me to charge my iPhone 5c, while the phone is still in it's case? Most Convertors don't, but I noticed on yours, there's a little lip between the lightning connector and the	30pin connector. Thank you, bye for now. Hi yes it charges as well. I have a Samsung home theatre system with iphone/ipod docking system which works well with my iphone 4 s playing music to all surround speakers. my question is will this connector work to my iphone 5c in the same way? Can you confirm whether this connector will allow me to play music on my iPhone 4s on a Sony XDR-DS16iPN docking speaker system. Thank you. Hi no it is for the iphone 5. This worked with my B&W Zeppelin Air! Hi, which of your adapters would be best for an iPhone 5s with a Logitech S715i Rechargeable Portable Speaker Dock ? I've tried many ebay/amazon sellers of your other adaptor (http://www.world-of-accessories.co.uk/iphone-audio-adapter-converter-p-1663.html) but none of them have worked ! Will this work with a Roberts DAB radio docking station? Will this work with a bose docking station? Hi yes all our Apple products work with OS7 but OS7 has many many problems and can reject genuine apple products . This Apple adaptor will work 90% of the time but if you are already having problems it may be better to just buy a new lightning speaker system. That said we do offer a full 28 day refund policy if any of our products do not work. Would this work with a Gear4 docking station which I had for my old iPhone 4? Yes it should do they work on 90% of things. If it does not you can send it back for a refund within 28 days. Hi I'm sorry to hear that is it charging the phone ? This will tell us if the adaptor is faulty or just not compatible with your unit for Audio. can you use this on the ipad air ? Hi yes they work on most makes of car but if it does not then send it back for a refund. Hi yes that is exactly what they do. Hi yes it will work with those. Hello, would these support the conversion of the lightening pin on a docking station to a the old 30 pin ipod/iphone, and support audio/video etc? Many Thanks, Sarah. Hi yes this will support Audio on 90% of things if you have a problem you can send it back within 28 days. Hi yes it should work fine if you have any problems you have 28 days in which to send it back to us. Hi it should tell you on the box if it fits the iPhone 5 if it doesnt then yes you will need an adaptor. Does the adapter fit the 5s with the apple supplied cover in place? Hi sorry we cant tell you as we do not know how thick the case you are talking about is. Does this work with latest IOS 7 update or for the iPhone 5s? Hi sorry we are not sure but if it does not work you have 28 days in which to send it back for a refund. Hi it should do i it doesnt you have 28 days in which to send it back. 30 pin apple connector iphone 5,will this work with my sony docking station ICF151P ? hey, will this play music from my bose speakers? Hi yes these are compatible with BOSE systems. Hi yes it will work with the Gear4 docks, just order it from our web site and we will post it straight out. does this adapter work on Bose speaker base speakers? Hi it should do it works on most Bose systems. Hi Im sorry but we havent tried that but if it does not work you have 28 days in which you can send it back for a refund. Hi we have sold hundreds and had two returned by one customer so far. Hi you have 28 days in which to return it if it doesent. Hi we have not tested it but there is no reason why it shouldnt. You have 28 days in which to return it if it doesent. can you use this to play music through the old ipod docking stations ? will this let me attach to my iPad mini and play through a docking station? will this adapter work with the 30 pin apple digital AV adapter? Hi it should be the same speed really as its the same power output but anyway glad you are happy.